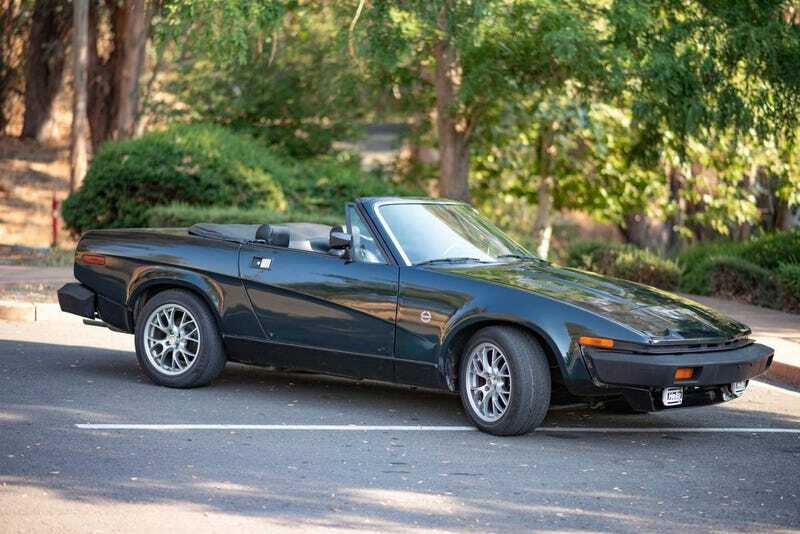 At $12,900, Might You Turn This 1980 Triumph TR8 Into a Wedge Issue? Originally conceived as an ugly duckling coupe, Triumph’s last-ever TR turned into a beautiful swan once the roof was chopped off. Today’s Nice Price or Crack Pipe TR8 adds balls to that beauty with a modded V8. Let’s see if the price makes it pretty as a picture as well. It seems like every decade has tried to set us straight. The ‘70s had the anti-drug “Scared Straight,” the ‘80s gave us “Straight Outta Compton” and the ‘90s offered up “Straight to DVD.” It’s that last—today more typically labeled “Straight to Video”—that has given us such major movie ripoffs as Atlantic Rim, Transmorphers, Fall of Man, and Apocalypse Z.
Yesterday’s 1975 Bricklin SV-1 Back to the Future homage could easily have been a set piece in just such a ripoff. Or perhaps, a bit player in an unnecessary parody of the beloved film series. Transformative but not transcendent, that DeLorean time machine wannabe tried really hard. Ultimately it failed, and based on the comments in went down equally hard. The car’s $15,000 asking price didn’t fair any better, earning a massive 94 percent Crack Pipe loss. After yesterday’s aborted attempt at going back in time, how about if we do so today for real? Here we have a 1980 Triumph TR8 that seems to have stood time’s test. It sports a cloak of black forest green and rides on flattering aftermarket alloys. Those look tidy, but in deference to the marque’s reputation for somewhat shoddy build quality, the wheel-center laurel leaf decals appear to be slightly off center. The TR7 and ultimate TR8 were the last of their line for the small British brand. That was a line that stretched back all the way to 1953 and the debut of the gentleman’s sports car, the TR2. Quite remarkably, the chassis underpinning the TR2 would get massaged over the years to serve under the TR3, 4, 5, and the 6. The TR7 would prove the first clean sheet design in the series, and would in many ways be the worse for it. Most egregiously, the TR7 replaced the brawny 2.5-litre inline six of its TR6 forbearer with a 2-litre SOHC four. Both horsepower and torque would suffer as a result. Other changes from tradition flaunted by the TR7 included a switch to a coupe-only body style driven by the expectation that the U.S. market would ban convertibles. That would feature a radically different wedge shape with the line’s first use of pop-up headlamps. It also featured bumpers so big you could train Olympic divers off of them. Another major switch was the replacement of the earlier cars’ lovely wooden dash panel with one made out of plastic. Ugh, what a downer. Unlike certain present day politicians, Triumph didn’t just make these missteps and then precede to double down on them. They instead tried to fix the problems. The first was with the introduction of a convertible version of the TR7. The next was with the addition of the V8-powered TR8. The V8 edition of the TR7 had been planned almost from the beginning. The brand’s membership in the British Leyland family meant ready access to the Rover (formerly Buick) 3.5-litre V8, and the TR7's engine bay was engineered to make it a cozy home. The Rover mill was used instead of Triumph’s own SOHC V8 because the latter had proven woefully problematic in the Stag. The initial TR8s sported a pair of Zenith Stromberg CD175 side draughts, and produced about 135 horsepower. Those ponies were put to the pavement through a five-speed manual transmission. This one has tossed the Strombergs in preference of a 4bbl Holley carb and requisite updated intake. Offy valve covers and a chrome air cleaner dress up the engine bay appreciably. It should be noted that while the car does live in California at the moment, the Holley upgrade is not BAR certified and hence will require some inventive efforts to keep the car licensed in the State. Other updates include a Wilwood big disc kit up front, new aluminum radiator, and perhaps most importantly of all, a block bored to 4.6 litre capacity sitting under all that stuff. The bodywork looks to be in terrific shape with all the appropriate decals present and accounted for. The interior is apparently all-new too, with fresh carpet and leather on the seats. That’s a mixed blessing since one of the TR7/8’s neatest features was the availability of jaunty plaid upholstery. The car rides on a set of lowered springs which serve to give it less of a dachshund in the tall grass appearance, closing the wheel arch gaps and hunkering the car down nicely. The title is clean and the car comes with just 80,000 miles on the clock. Triumphs are an acquired taste, that is for sure. Over the years I’ve acquired a couple of them and have appreciated their unique flavor while recognizing their inherent foibles. This TR8 represents what could be construed as the brand’s ultimate expression, and at $12,900, it could ultimately put a happy expression on the face of a new owner. That is, unless we say nay. What do you think, is that $12,900 asking too much for this hair shirt of an old British roadster? Or, does that price feel like a total triumph? At $15,000, Would You Go Brick to the Future in This Custom 1975 Bricklin SV-1? For $8,999, Could This Tastefully Modded 1980 Triumph TR8 Have You Shouting The British Are Coming?